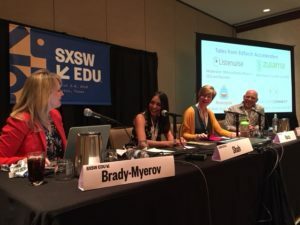 This year’s SXSWedu had an eclectic mix of sessions from AI and VR to a first grader sharing meditation strategies from the classroom. That’s a wide spectrum. And I think it’s makes SXSWedu so different from other education conferences. Because it’s not subject specific or tech specific, it attracts a wide variety of education leaders who want to talk about pedagogy as well as trends. I spent time in the Innovation Hub, where Listenwise had a booth. A mix of teachers, administrators, and industry scouts strolled by on a regular basis. Stepping into the San Diego Town & Country Resort for the CATE conference, I was transported to an era of tuxedos and ball gowns. That’s not what the teachers were wearing, it was just the aura given by the elegant ballroom and surroundings of the 1950’s era resort. What a great location to meet hundreds of English teachers gathering for the California Association of Teachers of English conference. 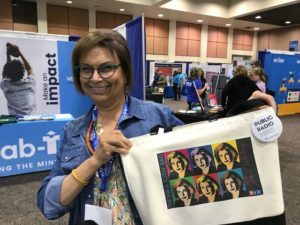 At our booth, we met many teachers who were looking for ways to improve their students’ literacy scores on the CAASPP by focusing on listening skills. The listening strand of the CAASPP is the most challenging for CA districts to meet, so they were excited to learn that we can help. Listenwise is the only tool that allows students to practice listening with a multiple choice, auto-scored listening quiz that mirrors the CAASPP. It’s clear English teachers understand the connection between listening and reading and are familiar with the research that shows better listeners are better readers. We are committed to helping improve literacy for all students and believe deeply that listening is the missing link to literacy. 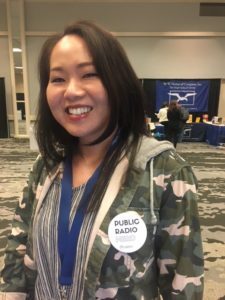 We also met many lovers of public radio who proudly wore the pins we gave away that proclaimed them to be a “Public Radio Nerd”. We escaped a Boston snow storm just in time to reach Palm Springs and make it to CUE on time. Good thing we did. What a great conference! 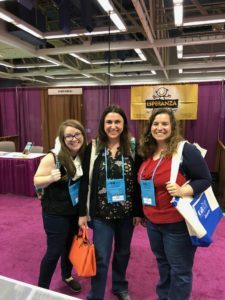 The first day was the most packed in the exhibit hall and we talked to SO many wonderful educators. It was clear that many people had just administered the ELPAC and were looking for teaching support, and others are thinking about the CAASPP. We met a lot of k12 educators, teachers, principles, and TOSAs. We were also lucky visit James Workman Middle School in Palm Springs and gain insight into how they use Listenwise to improve listening skills for the SBAC and their English Learners. Awesome to get feedback from current users on ways we can improve Listenwise and great to meet new users and share our 30-day free trial. This year’s CABE conference in Sacramento was centered around the strengths of bilingualism and the importance of equity for our English Learners. As always, CABE was buzzing with Mariachi music and we felt the infectious energy from parents, teachers, and administrators. Dozens of teachers and administrators attended our presentation on “How to Teach Listening for the CAASPP and ELPAC” and we found there was an appetite for resources to improve students’ listening skills. Did you know that listening was the lowest literacy strand assessed statewide in CA last year? The new English Language Proficiency Assessment in California, known as the ELPAC, is far more rigorous than the previous iteration, requiring a higher level of listening performance. Participants left the presentation eager to implement Listenwise in their schools and districts to help students practice listening comprehension. Back at the exhibit hall, we saw some familiar faces (shout out to the team at Sunrise Middle School!) and we made some new friends, too. Our conversations reaffirmed our commitment to providing the highest quality listening resources to bolster literacy skills and ensure that English Learners are given equal opportunity to realize their full potential. We had a great month – loved seeing old friends and meeting new ones – and as always do reach out to us if you have feedback about our product, etc. We love hearing from you!